Can’t work out because of whatever is ailing my back. But can still wander the woods. Sunny yesterday but bitter, with a cutting wind. Strangely I didn’t feel cold and my back felt the best that it has in days as I wandered the tundrad shoreline of Frances Slocum. Go figure. Huge stands of Joe Pye weed all up and down the shoreline. Europeans who came to the New World welcomed Native American medical knowledge. Though Europeans had commonly used herbs and other plant preparations to cure illnesses, they were not familiar with many of the plants they found in their new home. Native Americans had used these plants for centuries and generously shared their knowledge. Joe Pye weed (which can be dangerous if used without caution) is a native plant with many medicinal uses. The Iroquois and Cherokee used its roots and flowers as a diuretic to help with urinary and kidney ailments, while the roots and leaves could be steeped in hot water and the liquid taken for fever and inflammation. This weed’s unusual name has been attributed to a number of sources. One is that Joe Pye was a phonetic translation of jopi or jopai, supposedly an early native American word for typhus. Or, it derived from the name of a 19th century white “Indian theme promoter.” However, the 1822 third edition of the Manual of Botany, for the Northern and Middle States of America states that Joe Pye weed was named after a Native American in Massachusetts. Details of Pye’s life have not always been recounted accurately, but according to research by Richard Pearce, Pye was a Mohegan sachem (healer) who lived in an area where the weed (botanical name: Eutrochium purpureum) was used to cure an outbreak of typhus. 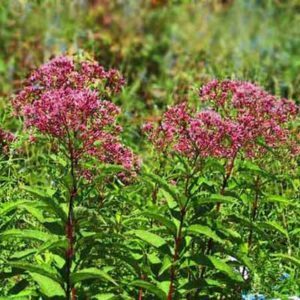 Joe Pye weed is a sweat inducer, which is probably the mechanism of cure. And endless goldenrod ball galls, including this double=header. The larvae, in turn, are important winter food for several creatures, especially downy woodpeckers and sometimes Carolina chickadees. Gray squirrels also may rely on the gall larvae in winter, especially during years when nuts, acorns and other favorite foods are scarce. Galls are common — albeit abnormal — plant growths caused by the larvae of certain insects and mites. Many plant species attract gall-makers, but goldenrods seem especially alluring to them. Goldenrod galls appear as round swellings as large as golf balls on stems. The commonest goldenrod gall is made by the goldenrod gall fly. In spring, the female lays her eggs on the stem. A larva from a hatched egg chews its way into the stem and the gall begins to form. No one knows just how a larva causes a gall to start, but it may have something to do with the larva’s saliva, which may mimic plant hormones. The larva stays in its gall the rest of the year and continues to develop. By late fall, it will be fat and ready to enter the pupal stage to develop into an adult fly, which will emerge the following spring. The gall itself will have hardened and become tough to open. To make sure that it can exit the gall as an adult, the larva in late fall will tunnel almost to the outside of the gall, leaving just a thin plant tissue inside. This will allow it to pop out easily as an adult in spring. Previous Previous post: Bad back-yard nature!